Or view larger version. The Christian Stairway. ca. 1885. Thomas Houseworth, photographer. Photograph. Collection of Oakland Museum of California. 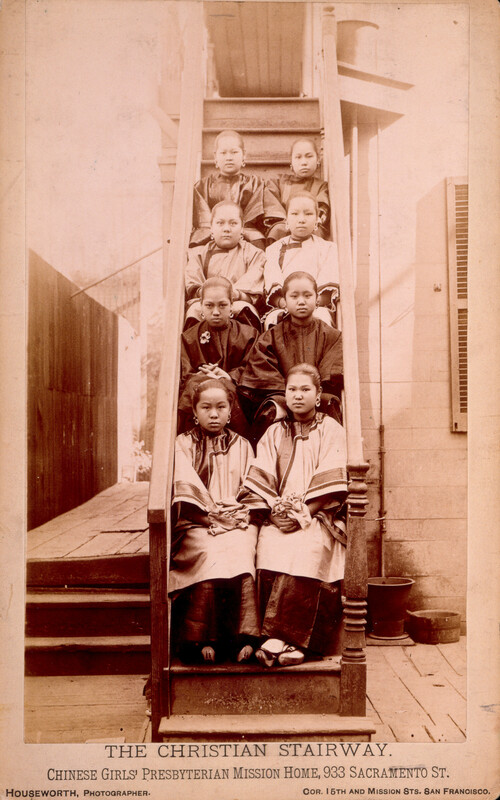 This photograph shows eight Chinese-American girls sitting on the steps of the Chinese Girls’ Presbyterian Mission Home in San Francisco, California. The Home was started in 1874 with the initial purpose of intervening on behalf of young, Asian immigrant females who could become vulnerable upon arrival into the United States, by being forced into prostitution. Often times, women and girls were smuggled into the United States thereby circumventing immigration laws that excluded them.